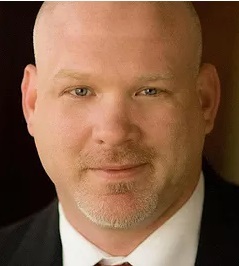 ~ Dustin J. Hedstrom, D.C. When you purchase a Eurotech DOC Decompression Table, not only are you getting the bestselling decompression table on the market, you will get a 100% return on investment (ROI) within months. Based on average demographics, paying off your DOC can be accomplished within months—you just need to attract approximately one new patient a month to cover your expenses related to spinal decompression! 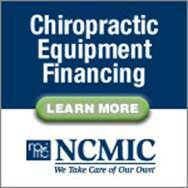 Section 44 tax credit and Section 179 is available with the DOC Decompression Table and DOC PRO Tower purchase. Adding a Decompression Table to your practice requires almost no direct time from the physician, allowing more revenue without increasing the amount of time spent! Patients are willing to pay cash for treatment—no waiting for insurance payments! Since there is no shortage of patients with back or neck pain who have tried everything else with limited success and are looking for something more effective and more permanent—they are willing to pay cash for it! This means that you can buy the table at a greatly reduced cost and will only pay as little as $6,499.80 plus shipping after credits and depreciation based on a 31% tax bracket. Thats the equivalent of 3 new patients! 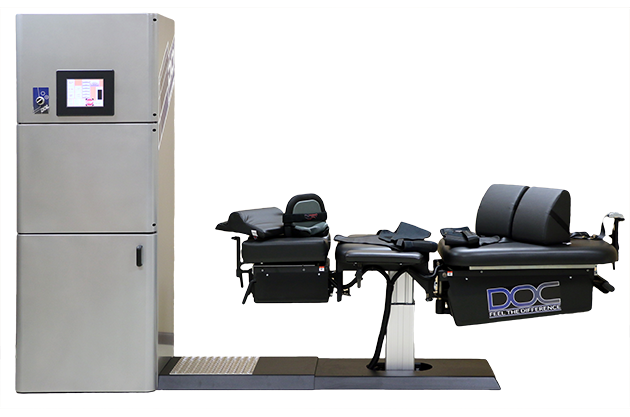 With a full 1-year End-to-end Warranty, and Section 44 Tax Credit, the DOC Spinal Decompression System has become our “Bestselling Decompression Table on the Market". We guarantee an incredible savings of$1,000 off retail OR free shipping, whichever is greater. Pricing may be different for international customers. Please call for pricing. We accept Check, Credit Card, and can arrange for a Lease. Delivery is typically 8 to 14 days from the purchase of the table. 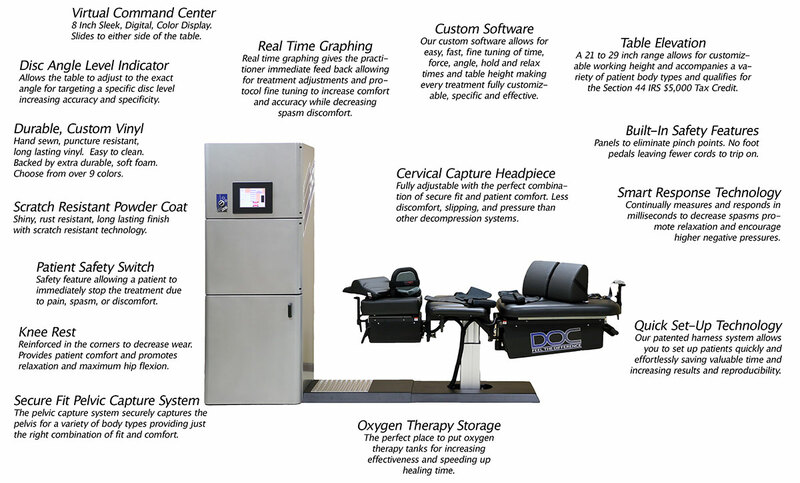 Get a DOC Decompression Table for around $350 per month! Our staff offers the highest quality in service, training, and marketing. Our long-term goal has remained the same since our first company, Grace Enterprise, was founded in 2000, to consistently provide high quality, innovative new and used Decompression Tables, at the Best Prices Possible. We offer the Highest Quality in Warranty and Best Price Guarantee on the DOC Table. The DOC Cervical/Lumbar Decompression Table has become our bestselling table. With a full one your end to end warranty, and our Elite Marketing Program, it brings to you everything you need to get started in the Spinal Decompression market. This will allow you to get a solid return on your investment with one of the world's most effective spinal decompression tables without having to pay an arm and a leg... That’s why this table has been called “the best table for your money”. In addition to getting “the best table for your money”, when you purchase a Decompression Table or Laser from our company Today, We Feed a Hungry Child Tomorrow. Our company cares about our customers and our communities. For every Decompression Table or Laser you purchase, we donate a percentage of our profit to provide a nutritious meal to a hungry child, through LIFE Outreach International. Please help us hit our goal of 1 million meals this year. It's customers like you that allow us to give back.